The mighty Horseman WAR has been feeling restless of late, a strange beckoning that he cannot explain seemingly calling out to him. Feeling the need to find the answer to this sensation he decides to journey to Earth in mortal form, all the while being exposed to one strange and humorous adventure after another as he tries to adjust to life as a human being. While there he experiences an overwhelming attraction to one woman. 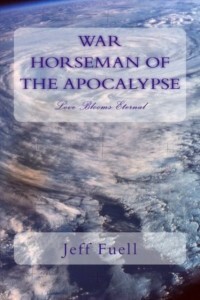 He soon finds out that she was his soul mate in a previous life… before he was chosen by God to take on the mantle of WAR, one of the Horsemen of the Apocalypse and one of the most feared and respected entities in the cosmos. Now, he must make a decision – will he continue to serve out the rest of his existence as the immortal Horseman, or will he choose to sacrifice everything in order to be with his true love once again? I had the idea as to what would happen if a deity, in this case a biblical character, fell in love with a mortal woman. What would happen? What would he do? What would he choose? My mind swirled with ideas and I created what I think is a very moving and humorous story with a surprise ending that I guarantee you that you will not see coming. WAR and the other Horseman are biblical characters. The rest of them are a product of my imagination. This book is a loose sequel to my book “Earth Angel” because one of the characters in that book makes an appearance here, as does God. He was walking the aisles of his museum, deep in thought. His trip to Earth had been a complete letdown, except for the discovery of hot dogs with kraut, and he was convinced more than ever that the mortals were doomed to destroy themselves. There was absolutely nothing to be found there of any value… except her. War raised his hand up before him and a small cloud appeared. In the center of it was a three-dimensional image of Julie. He gazed upon her with a longing in his heart that he had not felt so intensely since… he did not know when. Even the lust for battle and war paled in comparison to what he was feeling right now. He cursed himself for a fool. He was War! One of the most powerful and feared beings in the universe with strength unmatched throughout the cosmos… and he was in love with a mortal. There could be no denying it any longer. Despite who she was, there was some kind of connection between the two of them, he was sure of it, and it was driving him mad not knowing what it was. With the image dancing in front of him, he continued to walk onward through the halls filled with the history of his craft. He looked over and became aware of Conquest walking by his side. “Hello, Brother,” War said with a grin. “Really?” Conquest asked with an arched brow. “Is that what that look means?” Conquest said with a small laugh. They walked in silence for a few moments. “Not even on Earth for five minutes and already wrecking havoc,” he said playfully while shaking his head. “Well, maybe I did catch myself enjoying it once or twice,” he said. They both laughed. Conquest indicated the small cloud that was floating in front of them and War cursed himself for forgetting about it. He waved his hand and the cloud diminished. “I’m glad you approve,” he almost growled trying to hide his embarrassment. They walked on as they enjoyed the moment together. “Something is troubling you,” Conquest finally said. They stopped and faced each other. “Brother, may I talk to you in confidence?” War asked. “It may not be,” Conquest replied. Conquest remained silent as he regarded the floor between them. He raised his head and looked at him.